Dual DI Canister ¼" Ports . Perfect for adding additional stages to your current system. Comes with 5 feet of tube. Solidly built Double DI unit. Produces great water. 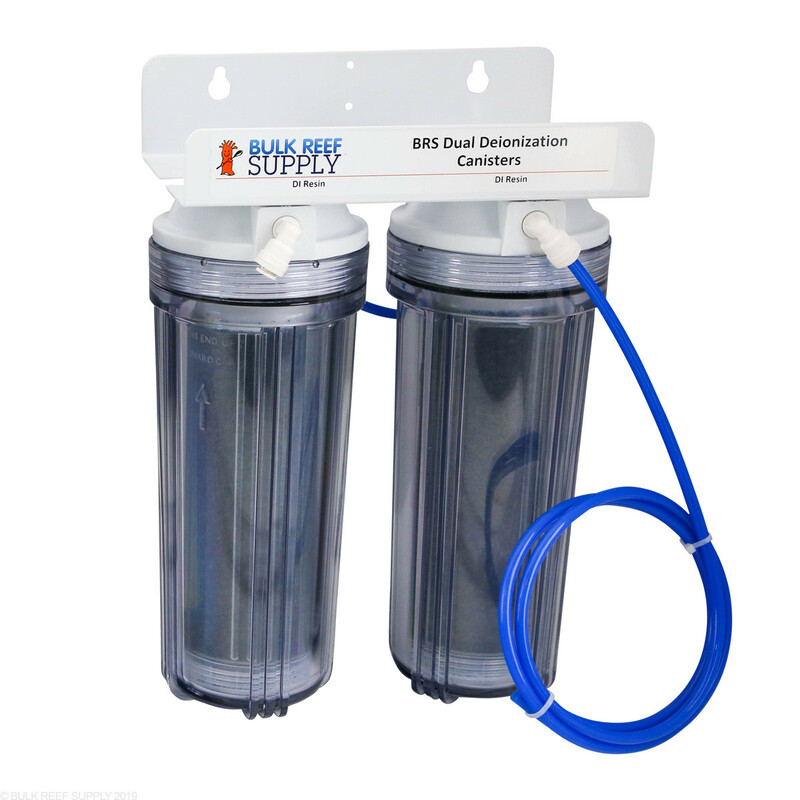 I added this Canister set to my existing RO system and I am now getting 0 TDS water out put. This unit takes the guess work out of when to replace the cartridge. It took me a while to pull the trigger on this upgrade. Was using disposable D.I. cartridges with a tds meter. But being able to see the color change, and hand pack the resin myself, removes any doubt that my tds meter my be misreading things. And it is not some cheap parts just thrown together. You can feel the quality of the parts used. If you have been looking for a D.I. add on to your R.O. system, look no further! Thanks BRS! Being a newbie I ordered only an RO unit out of the gate and thought TDS readings of 10/11 wouldn't be a big deal. Boy was I wrong.... Added this afterward and dropped to 0. My algae problems are almost gone now. This product is top quality. The price is great. 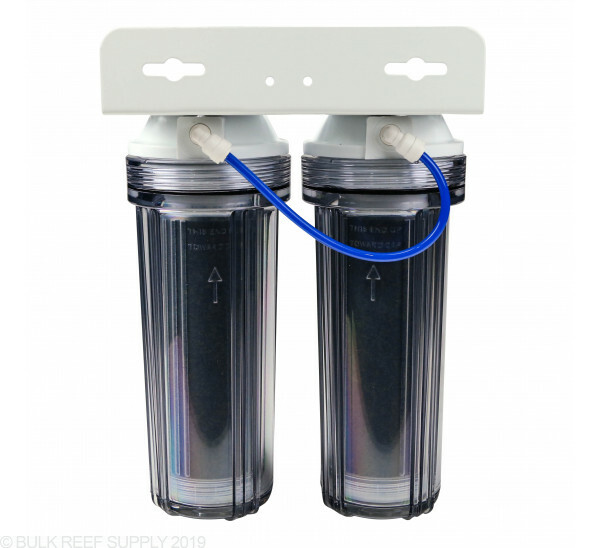 Can these be purchased filled with pro series cation and anion resin? Is it possible to get this setup with 3/8" ports since that is what I already have? We do not have the ability to custom a Dual DI set up unfortunately. You can adapt the 1/4" input and output with the item listed below. Is it safe to use this product has an add on to a RO system for drinking water? Great question! 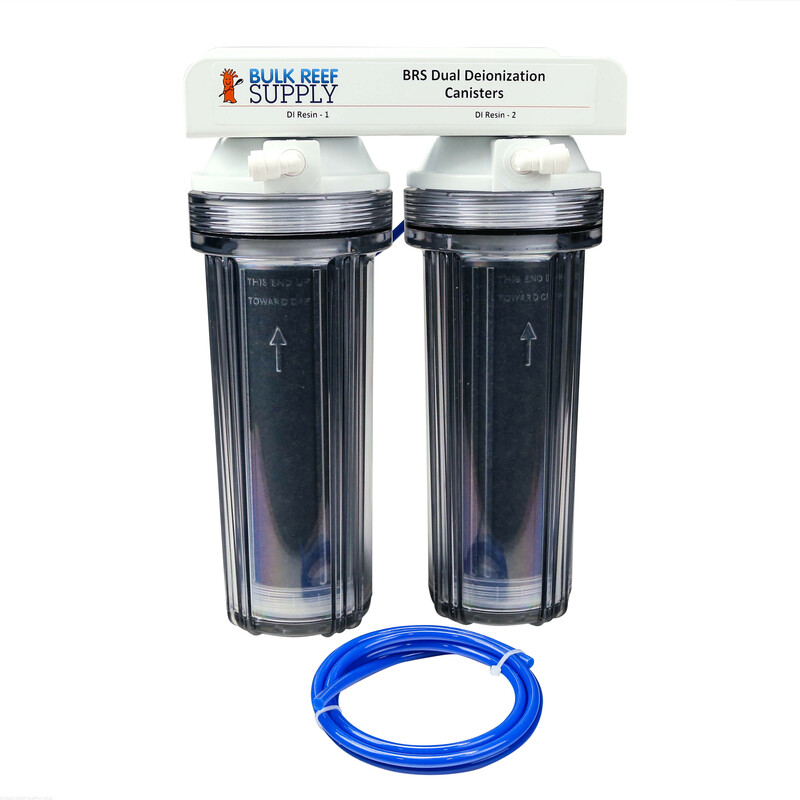 BRS does not recommend DI filtration for drinking water systems. Is this resin the same as "Ion Exchange Resin"
Are the cartridges refillable? Thanks! Does the DI resin come packed in the housings seen in the photo or are they in refillable cartridges that slide into the housings? Great question! 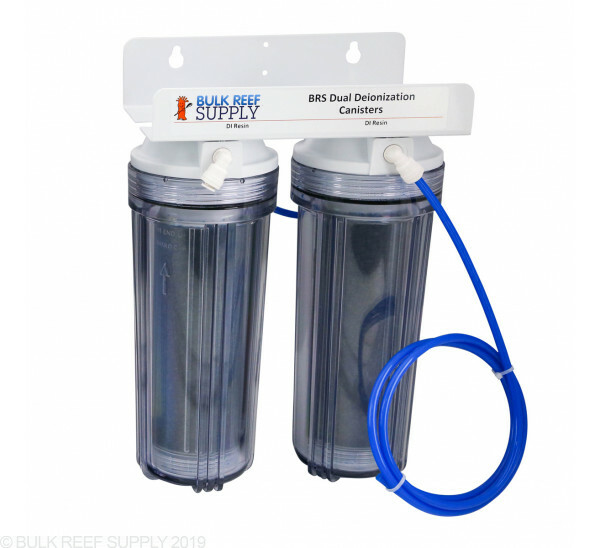 Unfortunately we do not have this exact unit available with out DI, however we do sell replacement canister housings here: https://www.bulkreefsupply.com/reverse-osmosis-canisters.html, please note, fittings are sold separately. I already have an ro (GE one that only does 11g/day.....). Would adding a T with shut off valve after ro process to bypass the pressure storage tank, then adding the dual di right before my brute trash can ro storage work? The DI resin it comes with... Is it the color changing resin or regular resin? You will want to Tee off the RO water before the DI stage to send water to an RO drinking water system. The other side of the tee will connect to the DI stage. Feel free to let us know if you have any further questions! 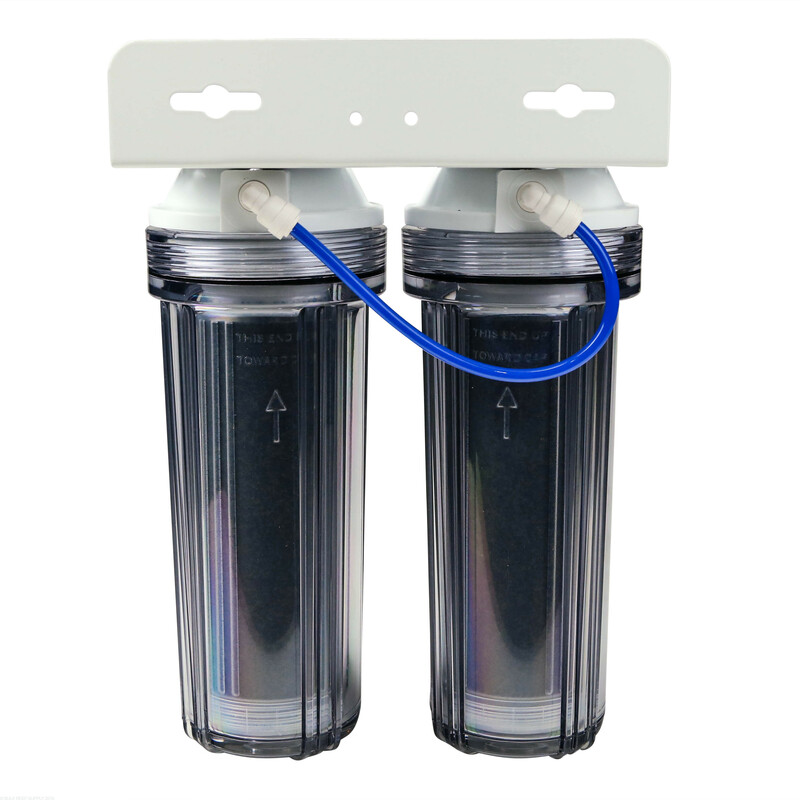 Do the dual deionization cartridges that come filled with DI resin with the unit come with color changing resin? or non color changing resin? This kit will come with 2 cartridges filled with Color Changing resin. Feel free to let us know if you have any further questions!